We’ve long established that this journey of ours is bound to be a long one, littered with many mistakes, hurdles to climb and small successes. The mistakes and hurdles are far more likely to pop up, and will dominate our thoughts and efforts, in particular how to avoid and overcome future occurrences. The successes on the other hand, no matter how small, don’t seem to get quite the same attention. This became apparent in a recent group conversation, which went something like this. Person 1: ” I wore a pair of pants today, that’s rather very well fitting but for some reason, it’s falling off my waist today. I just figure that it’s really stretched out because of how big I am and it’s just gotten bigger than normal. But the waist has been falling off today, so I don’t know”. Person 3: “No, I don’t think the pants stretch out! My girl you’re working hard, we’ve seen the videos you’ve posted! Why do you have to feel that the pants is stretched out?! It doesn’t have to show on the scale. This is what you are using as your measurement. So if it is the case where the pants shiggle* off you, that’s a good thing”. Person 1: “Ok friends, I’ll admit that my body has made some adjustments. Walking around I feel better in my body. I still have a ways to go, but I kinda like it! We are quick to downplay and disregard the smallest of successes. Whether this comes from an inability to trust ourselves to do what we say we are going to do, or from the belief that the mistakes (relatively speaking) along the way negate any positive changes, we aren’t entirely sure. But we are certain, that by taking even just one positive and small win at face value, we stay fired up and begin to trust that our efforts matter. We thrive knowing we have a support group and are being held accountable. It’s very easy to rationalize skipping exercise or missing meals, but with people in your corner who give you valuable feedback, support and hold you accountable, finding success seems almost guaranteed, even if in the smallest of fashion. Who wouldn’t want that! when clothes that were previously form fitting, suddenly become loose and no longer fit the shape of your body due to weight loss. when clothes require either a manual process to keep them on your body or the addition of a belt or other related suspension. The act of clothes falling off your body due to change in shape. Urban dictionary defn: feeling of euphoria because your clothes no longer fit due to lifestyle changes. I love your post. 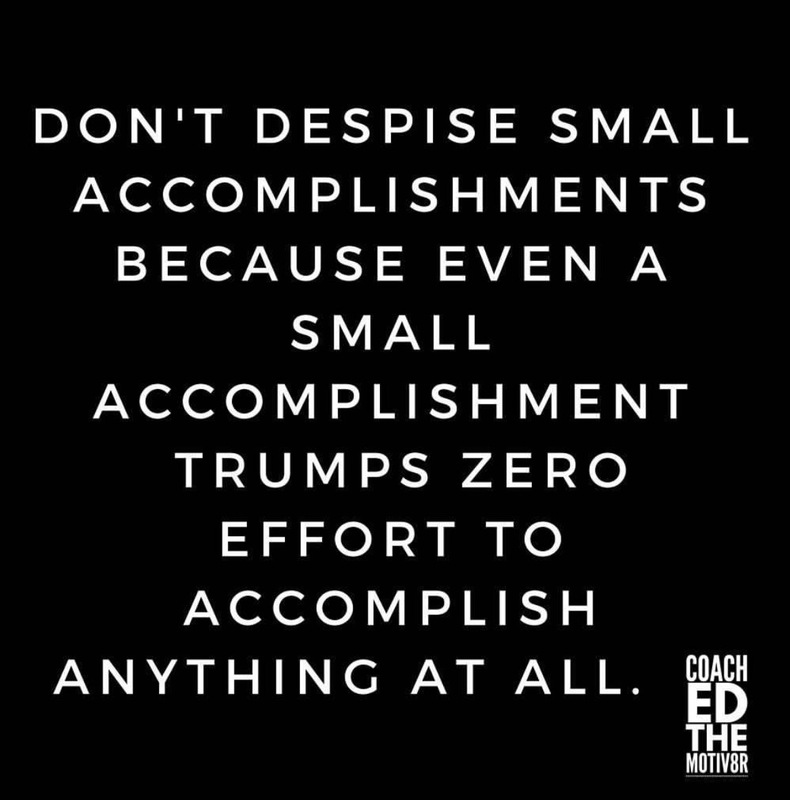 Of course,there is the need to appreciate small accomplishments, but it doesn’t mean dwelling in the euphoria and let other opportunities pass by. Agreed totally Macy! By celebrating the small things, we get fired up to keep going. By consistently taking action – including capitalizing on opportunities – we get closer and closer to the bigger goals! Get after it girl!